I had a front row seat to the Wallace Foundation’s National Summer Learning Project during my time as CEO of the National Summer Learning Association. While I often presented to grantees from Dallas, Pittsburgh, Rochester, Jacksonville and Boston on the policy landscape and national trends in summer learning, I learned a great deal in turn from them and the evaluators at RAND about the practices that support high-quality programming at scale. 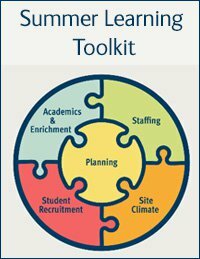 As a consultant, it was a pleasure to be part of the team that built the Summer Learning Toolkit, a rich online resource for the field, full of adaptable tools and expert guidance for school districts and their partners to use in an evidence-based approach to planning. With The Learning Agenda, I provided overall editorial support and copy editing for 50 tools and resources, writing guidance for best use of those tools. I also wrote the copy for the web site and collaborated with the talented web teams at Crosby Marketing and Wallace to ensure the design and copy worked together seamlessly.